Today is Homecoming for one of our district high schools. The kids are all excited, because it means they get to sit outside and enjoy a football game while eating all manner of junkfood and sodas for dinner. I’m excited because I don’t have to cook. As The Queen dictated, everyone should go enjoy a high school football game! The most wonderful part about a high school football game is the support for the teams, even when they are losing. That, and the fact that we don’t have to worry about a Lockout, or some such silly thing. 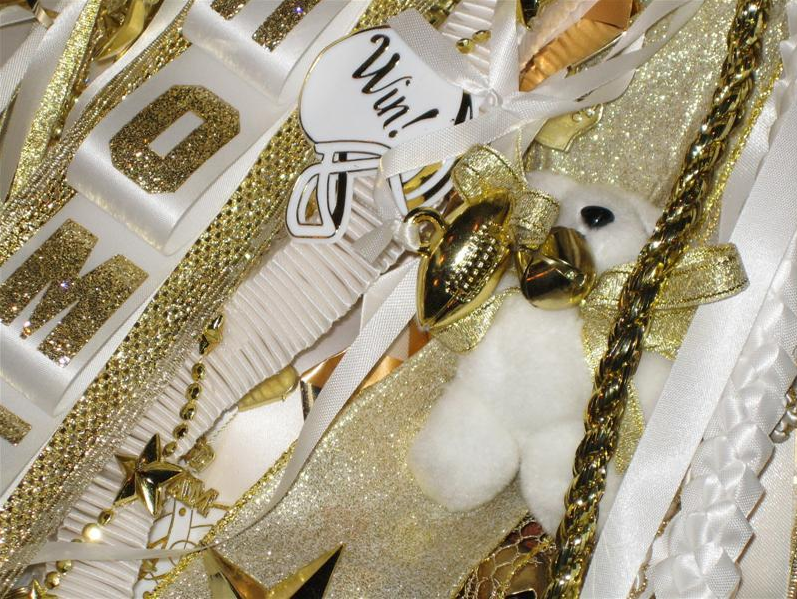 One thing that is traditional here in Texas, is the Homecoming Mum. When I went to school, back in the Iron Age, your date bought you the mum, which consisted of actual chrysanthemums. He went to the flower shop, ordered however many mums he wanted, with whatever amount of ribbons, along with sundry embellishments like little cowbells, whistles, footballs, chains, etc. The tackier, the better! But as time progressed, and brought us into the Internet Age, things changed.